In the past month, the ASTI team has been busy onboarding new communities onto the Solar Roadmap from the San Francisco Bay Area to New York and Washington, D.C. We are actively working with a dozen regional partners who are helping to reach out to their local jurisdictions in an effort to develop their local solar markets. The Green Team San Joaquin, an ASTI regional partner, presented the Solar Roadmap to new communities at an Energy and Economic Development event in the California Central Valley. The team is excited to officially partner with Utah Clean Energy to bring the Solar Roadmap to cities, counties and utility across the state. 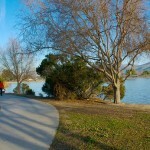 The City of Fremont, the fourth largest city in the San Francisco Bay Area, has quietly made strides in transforming itself from a typical suburban community to a sustainable urban center by adopting renewable energy goals, streamlining solar permitting, and participating in regional efforts to deploy solar. 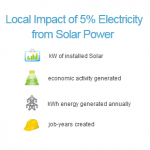 There is a noticeable lack of consideration for solar installations on new developments. 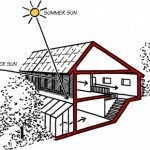 The many advantages of incorporating solar at the time of construction – including lowering installation costs, mitigating roof life issues, and easier financing – is a huge missed opportunity. 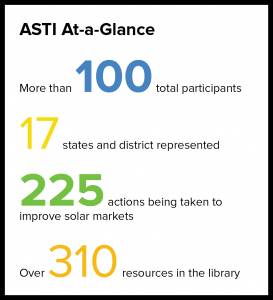 The American Solar Transformation Initiative (ASTI) team works to deploy the Solar Roadmap in a regionally unified manner wherever possible, which helps to have partners with strong roots in a given area. 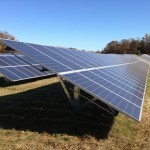 The Central New York Regional Planning and Development Board is one such partner helping to deploy the Solar Roadmap. The Washington Suburban Sanitary Commission commissioned two 2-megawatt (MW) solar photovoltaic installations at wastewater treatment plants, saving ratepayers approximately $3.5 million over the 20-year power purchase agreement. As the Solar Roadmap’s market potential assessment demonstrates, all solar markets are local and each region holds millions of dollars in untapped economic impact. This feature helps helps your community determine its solar market potential with a customized snapshot of the potential economic, generation, and environmental benefits of solar adoption.